DON'T MESS WITH THIS TEXAN! On the last leg of his tour of duty, Captain Garrett Lockhart is summoned home to Laramie, Texas, to handle an urgent family matter-a scandal that could destroy the enduring legacy of the Lockharts. Except it's already being ?handled" by Hope Winslow, a professional crisis manager. Hope is also the beautiful single mother of the most adorable baby boy the Army doctor has ever seen. Garrett is resisting Hope's efforts at damage control-and pushing her clearly defined boundaries. 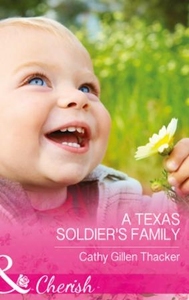 Too bad she can't resist him...and fantasies of a future with her Lone Star soldier!